On the last posting, you found out a bit about Donna and Peter. I hope you had a chance to visit their website and see their work. This posting is about Peter Thomas’ book arts workshop conducted at the Degolyer Conference. 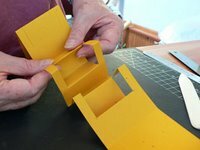 By the end of the workshop we had created a new book structure Peter calls the Nested Accordion Pop-up Fold Book. This structure combines a basic Accordion book structure with a pop-up structure. This combination of book techniques, as well as other creative book structures they have developed, are in their new book – More Making Books By Hand. The drawings and step-by-step instructions are very easy to follow. Cut the outer and inner accordion strips and fold them into shape. In this case, the outer accordion is the gold color paper and the inner accordion to be nested is the cream color paper. Look at yesterday’s posting to view the easy way of getting a perfect accordion fold. I like using contrasting paper for its visual appeal. Notice how the accordion structure has high folds and low folds? The low fold is called a valley while the high fold is called the peak. Only three interior panels should be cut. The front and back panels should be uncut. The accordion book is in a folded position except for the edge panels. Be sure they are out of the way before you start any measuring or cutting. First measure down 5/16″ from the top edge of the folded book. Second measure up 5/16″ from the bottom edge of the folded book. The third measure in 1 7/8″ from the fore-edge of the folded book. This should be half measure of the folded panel. If you need to draw a line to get the cuts straight, use a pencil so that it can be erased when you are finished. Now cut from the center point of the panel along the 5/16″ mark at the top and the bottom. Cut through all the fold layers carefully. Keep the xacto knife perpendicular to the ruler at all times. It isn’t necessary to cut through all the layers the first time. It will take several passes to go through each panel. Don’t lift the ruler until you are sure that all layers have been cut. Often you can tell by the sound and feel of the cuts. Also, the edges will lift as they are cut free. When you have finished cutting you should have what looks like loose flaps on either end of the folded book that go only halfway into the folded panel. When you have finished cutting, align you ruler on the vertical center of the folded panels. Use a bonefolder to score between the top and bottom cuts. Keeping the ruler in place, you can gently lift each panel at the foredge to deepen the crease that the score has made. Open the folded paper strip. You should see three panels that have been cut at the top and bottom of the panels. The score will faintly show on each side of the slices. Invert the fold of each of the three cuts. Carefully crease each the scored folds – there should be six of them. When you are finished there should be three panels that show a reversed pop-up structure. It sort of looks like a suspension bridge. Davy board is typically used for hardcovers. Always cut the board so that the direction of the grain is parallel to the back and fore-edge of the book. If you don’t the boards will warp when the paper covering and endsheets are glued to them. This can create a poorly constructed book at least and can in some cases pull the book apart at worst. For this book, cut two hardcovers that measure 2 7/8″ x 1 7/8″. To cover the davy board, cut your selected paper to extend at least 1/2″ to 3/4″ beyond the davy board size on all sides. When covering the davy board, the bookbinder looks to eliminate the bulk of paper on the corners. That is why the corners are cut at a 45-degree angle tangent to each corner. Be sure to leave at least a board and half width at the very corner edge. This will give the proper coverage of the board without any gaps. I fold the paper over the corner of the board that is squared. The creased folds will give a visual line to cut along. Be sure to cut out about 1/8″ from the crease to allow for the corner tip coverage. Apply PVA glue, to the paper. Lay the davy board face down on the backside of the paper. Align inside the cut corners, giving space for the overlap of the corner tips. Press and hold until set. You can use a weight to keep the cover in place. Once the glue has set, start with either the head (top) or the tail (bottom) of the board. Use small scissors or xacto knife to slit the corner. This will give you a sliver of paper to wrap around the corner when gluing. Apply glue to the paper at the top of the board and fold over the board edge. Tuck the cut with the bonefolder over each side edge. Do the same procedure with the bottom side of the board. After the top and bottom is glued and tucked, move to the sides and glue them into place. Use the bonefolder to smooth the board edges and flatten the paper into the board. The front side of the board is the paper covered side. The back side of the board will have the edges covered with paper – the center is the gray davyboard. Lay the covers backside down on wax paper. Fold the wax paper over the top of the covers. Wax paper prevents any excess glue from sticking to any porous surface. Place light weights on both cover boards for about 20-30 minutes. The weighting process keeps the book cover from warping as the glue dries. Typically, when one side of a board is glued it will bow in that direction. However, once you glue the end panels to the back of the board cover, the bowing will equalize because the glue is pulling on both sides as it dries. Once the cover paper on the boards set (they don’t have to be completely dry), it is time to glue the end panels of the outside accordion strip. Orient the gold accordion strip so the board cover will be attached to the “back side” of the accordion. The front side will hold the nested cream paper accordion strip. Glue the front end panel with the PVA glue and after a couple of seconds wait time, lay the end panel on the back side of the covered davy board. Be sure the corners are squared. Now do the same to the back end panel. Use the bonefolder to flatten and smooth the end panel into place over the davy board covers. Place the light weights on the ends for a few minutes to set the glue. The inside accordion strip needs to be shortened to nest in the outside pop-up structure. Cut off two of the panel sections. this will leave an inside accordion strip with six panels. The inner accordion nests inside the outer accordion’s pop-ups. Match the valley of the inner accordion to the valleys of the outer accordion. There are two ways to attach the inner accordion to the outer. One is by gluing the valley sections to each other. I apply the glue to the outer accordion pop-up valleys and then lay the inner accordion on top. This allows for the mountain folds of the inner accordion to stand up and be free. The other way is to sew the valley folds together using a thin strong linen or cotton thread. In a pinch, you can use a nylon sewing thread. The choice of attachments depends on the look and feel you want with the final book. This tutorial sample shows the glued version. Of course, each book begs for content. These miniature books are great for image collages, poems or quotes. Have some fun and check out Peter and Donna’s other structures in the More Making Books by Hand. I cannot believe there aren’t more comments on this, it is absolutely brilliant. And quite mod-able for whatever project you might undertake. I especially like that you included sewing as an option. I would never have thought of binding the two in that manner, it’s rad. Will definitely be experimenting with this one! Sorry for the late response. Glad you liked the structure. It is fun to do and very easy compared to precise measuring of the folds. Hope your experimentation is fun and turns out the way you expect. This is wonderful, thank you! Came here from Byopia Press. I find text and images much clearer to follow than videos, so I love the way you’ve done this.